Designed to be a combination of the large, spacious F-Pace and the two-seat F-Type sports car, the Jaguar E-Pace is a crossover car that's meant to be fun to drive. With luxurious options and powerful engines, it offers families something that feels more special and upmarket than a Nissan Qashqai, Ford Kuga or Volkswagen Tiguan, all of which are crossovers that blend the comfort and fuel economy of a hatchback with the extra space and height of an off-road car. As you'd expect, list prices for the new car start at £28,545 for the most basic-but-well-specified D150 diesel model, which is more expensive than a standard crossover, and a little pricier than other rivals, including the BMW X1, Mercedes-Benz GLA, and Audi Q3. It's bigger than those cars too, with a larger 577-litre boot (150l more than in the Q3); large, deep interior cubbyholes; and plenty of legroom and headroom in the back for six-foot adults. Take a walk up the price list and the new E-Pace starts to shine, with the most costly R-Design HSE models being the only model in its segment to be offered with enormous 21-inch alloy wheels, while a myriad of premium paint finishes and luxurious interior niceties are available to those with the cash to spare. As you add the options, though, the price of the car creeps closer to larger models, including the BMW X3, Audi Q5 and Range Rover Velar. Jaguar expects the majority of its customers to plump for the better equipped, more powerful and more expensive variants, which also come with four-wheel drive for extra grip when accelerating on slippery roads. It's not really designed for off-road use though, with a set-up that prioritises comfort, grip and stability on tarmac. So the car does drive well, with the ability to raise a smile when the roads start to get twisting thanks to suspension that absorbs bumps, while being firm enough for sharp cornering without a great deal of leaning. When you want to settle down for a long motorway journey, the car will follow suit, delivering a smooth and quiet ride. It's more sophisticated than a BMW X1 and considerably more so than a Mercedes GLA or Audi Q3. If you do choose those extra-large large alloy wheels, then you will be more aware of jarring from the scarred road surfaces of Britain but customers can specify optional variable dampers (read sophisticated suspension) that will stiffen or soften depending on the type of driving mode selected, providing a comfortable ride and swift changes of direction. The most basic models come with a six-speed manual gearbox but Jaguar expects most to select the nine-speed automatic gearbox, which is smooth, responsive and by far the easiest to live with day-to-day. Step inside and you are greeted by typical modern Jaguar standards. All but the entry-level cars have leather seats and neat, leather-covered surfaces. Every E-Pace comes with Jaguar's latest Touch Pro system with a 10-inch dashboard touchscreen. The system looks crisp but can be a little bit clunky to use, with menu screens often caught out if overloaded with requests from the user, while connectivity with smartphones is limited to Jaguar's own software, which is cumbersome. Any of Jaguar's upmarket rivals come with slicker software. There is also the option to specify a screen behind the steering wheel which replaces analogue dials with a selectable and adjustable digital display. It's a feature that's quickly becoming standard in the segment - not just from premium rivals, but cars such as the Peugeot 3008 too. Need more tech? Customers can also tick the head-up display options box, which projects vital information onto the windscreen ahead and the E-Pace is also available with a wearable Activity Key. The waterproof and shockproof wristband has an integrated transponder, which allows the driver to lock the main key inside the vehicle when out enjoying activities such as running, swimming, surfing or cycling. The E-Pace gained the full five stars for safety after crash testing by the independent Euro NCAP organisation, and there are two sets of Isofix points in the rear seat to securely attach child seats. The entry-level model comes well specified inside but power is sent to the front wheels only, making it less capable in adverse conditions than all-wheel-drive variants. An official figure of 60mpg is impressive, but you should expect around 44mpg in real-world driving. This well specified model include a powered boot lid, 360-degree parking camera and high-speed automatic emergency braking. The petrol engine is powerful, quiet and relatively economical, while the nine-speed automatic gearbox delivers smooth acceleration. The most powerful P300 petrol engine develops 300hp, which sees the 0-60mph sprint dispatched in just 5.9 seconds. Diesels are prefixed with a 'D' and petrol units with a 'P'. Three different power outputs can be specified with diesel engines (150hp, 180hp and 240hp), while petrol engines are offered with 250hp and 300hp outputs. AWD indicates that the car is fitted with all-wheel drive for extra grip in slippery conditions. There is a dizzying array of trim levels on offer, with entry level models simply badged E-Pace. S, SE and HSE add further interior and exterior niceties, while an R-Dynamic kit lends the E-Pace a sportier exterior presence. 6-speed shows that the car has six gears. Customers can choose between a standard manual transmission in D150 and D180 FWD and AWD variants but the rest of the range comes fitted with a nine-speed ZF automatic gearbox. 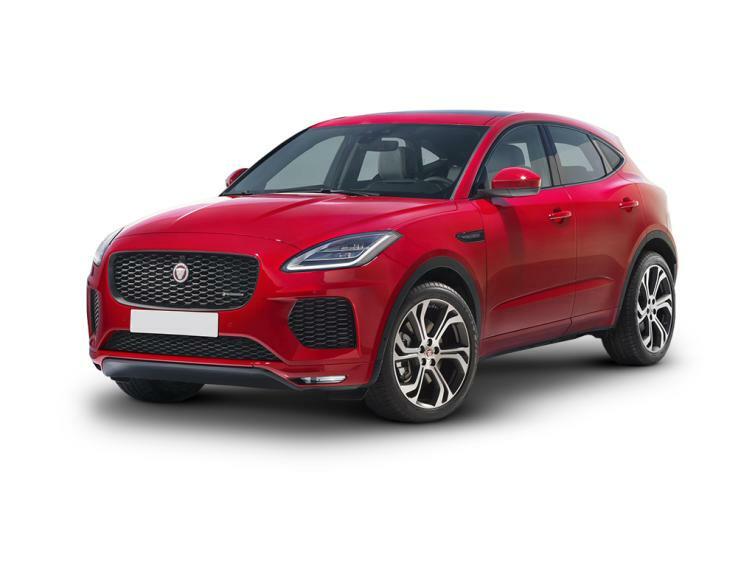 The new Jaguar E-Pace is essentially offered with two different engines: one 2-litre diesel unit that comes in three escalating power outputs and a petrol option of the same capacity, boasting the same number of cylinders and available in two power options. All of the engines fall under Jaguar's latest Ingenium badge, which ushers in new levels of performance, comfort, refinement and low emissions levels, with the entry-level D150 returning an official figure of 60mpg, although estimates from the Equa Index, which is based on real-world fuel economy testing, suggest that you should only expect 44mpg in normal conditions. It's also competitive in terms of CO2 emissions, with the aforementioned D150 engine cleaner than the rival BMW X1 xDrive20d (153g/km). With the liberal use of aluminium and its general lightweight construction, the E-Pace feels sprightly even when equipped with the least powerful diesel engine. The more powerful D240 engine is definitely the unit to opt for if you plan to tow caravans, boats and other lifestyle accoutrements, as its pulling power is in another league. But this is thirstier than the less-powerful models, and its new price is pushed up by the hefty cost of taxing it in the first year. Small, stylish SUVs like the E-Pace are commonly found cruising the inner city streets or regularly completing the short hop school run, where a petrol engine is the more sensible option. Unfortunately, there is no lower-powered petrol option here, with the smallest P250 delivering 250hp, for a brisk 0-62mph acceleration time of 7 seconds. This is all well and good but real-world fuel economy is just 31mpg, which could get expensive. It's unlikely to have an adverse effect on sales but with demand for diesel engines tumbling, customers may well start crying out for or hybrid version in the near future. Of course, owners can drop the internal combustion engine entirely and wait for the forthcoming all-electric I-Pace, which will give the Tesla Model X a run for its money when it launches later this year. The scope of trim options available on the new Jaguar E-Pace borders on the slightly ludicrous, but the list you see here isn't quite as complicated as it first appears. Most basic models are simply badged E-Pace and these come equipped as standard with fabric seats, a 10-inch touchscreen system (digital radio and Bluetooth compatible), four 12V power outlets and two USB sockets, second row air vents and rear Isofix for child seats. Outside, vehicles have the smallest 17-inch alloy wheels, bright LED front and rear lights and twin tailpipes. There's also an impressive array of safety and assistance systems thrown in as standard, including hill hold assist, to prevent you rolling back during hill starts, automatic emergency braking and a pedestrian airbag system. Move up to the more expensive 'S' models and you'll gain larger 18in alloy wheels, auto dimming mirrors, grained leather and electrically adjustable front seating, sat-nav, a Wi-Fi hotspot and full smartphone compatibility via Jaguar's InControl Apps (although this doesn't inclue Apple CarPlay or Android Auto). Drivers are also assisted by traffic sign recognition and adaptive speed limiter, as well as a 360-degree parking camera and rear traffic monitor with park assist functionality. Stepping up to SE models sees even larger 19-inch alloy wheels added, heated mirrors and a power tailgate bolted on, while a more powerful 380W Meridian sound system greets audiophiles. A special Drive Pack, which adds adaptive cruise control, high speed emergency braking and blind spot assist, is also thrown into the mix. Finally, the range-topping and therefore most expensive HSE models come with enormous 20-inch alloy wheels, keyless entry and a gesture-controlled power tailgate, meaning it's possible to open the boot by waggling a foot under the rear bumper. Inside, there are perforated Windsor leather seats and a digital display behind the steering wheel, replacing physical dials. Heated seats, head-up displays, the previously mentioned Activity Key, countless paint and wheel options, privacy glass and additional technology all available at a price. There's also a First Edition model for sale until the end of the year, which includes Caldera Red paint and 20-inch Satin Grey Diamond Turned finish alloy wheels and a panoramic sunroof. Inside, exclusive Ebony Windsor leather with Flame Red twin-needle contrast stitching feature, as do carpet mats and branded metal treadplates that are unique to First Edition. High specification suede cloth headlining is used throughout and the optional Head-up Display system also comes as standard. Jaguar's three-year/unlimited mile warranty goes slightly beyond the typical cover offered by rival manufacturers but the British brand doesn't exactly have a spotless reputation for reliability. That said, its most recent XF model ranked second in the 10 most reliable cars to own category in last year's Auto Express Drive Power Survey, despite a heady 31.7 per cent of owners reporting problems with their cars. The report suggests that these complaints are usually minor foibles rather than major mechanical faults, while servicing and repairs falling outside of warranty are reportedly quite costly. However, the E-Pace is still too new to comment on its reliability ranking. You'll struggle to find many used Jaguar E-Pace models, seeing that the model has only been on UK roads for a couple of months, but the future looks bright for potential owners thanks to strong used car values. Nearly new models sporting less than 100 miles are beginning to crop up though. These are generally quite similarly prices to new cars, but come with the added bonus of not having to spend time on a waiting list. First Edition cars come extremely well-equipped. These are only available for the first year of the E-Pace's life and include a panoramic sunroof; 20in alloy wheels; black leather seats with red stitching; 18-way adjustable front seats with heating; extra power sockets; and a head-up display. Prices start from £28,545 for the most basic-but-well-specified D150 diesel model, making it one of the more affordable premium SUVs on sale today. Its sharp lines and design features are more in line with Jaguar's F-Type, than its Sports Utility Vehicle (SUV) moniker would suggest. The E-Pace drives well too - it has the ability to raise a smile when the roads start to get interesting thanks to firm but pliant suspension and precise steering, yet it manages to provide a comfortable and quiet ride on longer motorway journeys. Inside you are greeted by typical modern Jaguar standards, including lots of neat, leather-covered surfaces, piano black trim and the latest Touch Pro infotainment system with a 10-inch touchscreen display. The system looks crisp but can be a little bit clunky to use, with menu screens often caught out if overloaded with requests from the user, while connectivity with smartphones is limited to Jaguar's own software, which is cumbersome. Rear passengers will enjoy the surprising amount of head and legroom, while the spacious boot is large enough to fit luggage, prams, golf clubs and much more.